For our Korean Wine & Dine event, my friend Tom helped prepare this dish! It's a wonderfully refreshing salad, perfect in warm weather with a nice subtle hint of heat. In a medium bowl, stir together vinegar, black pepper, and red pepper flakes. Heat oil in a saucepan over medium-high heat. Stir in sesame seeds, and reduce heat to medium. Cook until seeds are brown, about 5 minutes. Remove seeds with a slotted spoon, and stir into vinegar mixture. Mix in cucumber, green onions, and carrot. Cover, and refrigerate at least 5 minutes. Oh, I love, LOVE this salad. I make it often, so delicous! Bravo! Thanks for reminding me that this salad is around because now I wanna make it! 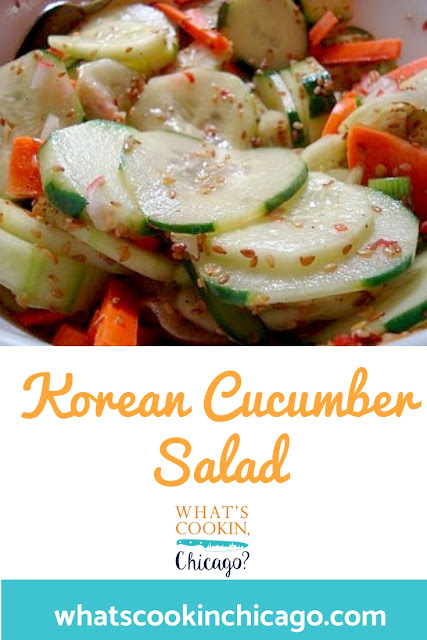 Great salad - the cukes look so refreshing but with a nice bite! This would be great with some grilled fish.